Although it’s cute to see a little princess or cheerleader on Halloween Night prowling the neighborhoods collecting candy for her parents (let’s be honest), I want my daughter to stand out from the crowd. Each year I strive to create a costume for my young daughter that is truly one of a kind and that will encourage her to be different. Our theme each year is none other than the best thing ever…FOOD! Believe it or not this costume was fairly simple to make. The hardest part was the time that it took to create this delicious masterpiece. I worked roughly 28 hours total to toss this bad boy. Yeah, I might whine about all the time it took, but come on it looks awesome! 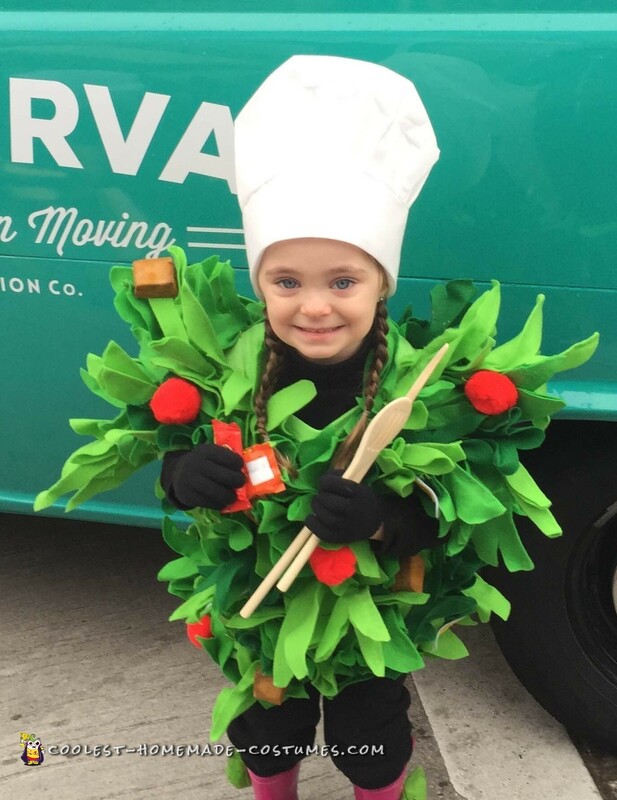 The best part about this Chef Salad costume was walking around our local Day of the Dead Festival here in Texas and hearing everyone in the crowd giggle and say, “I get it, she’s a Chef Salad!” or “That is the best costume I have ever seen, can I take a picture?”. It feels rewarding to see all of that hard work and effort pay off. 2. Using hot glue, create a line of glue going down the middle of each leaf and fold together to create a seam. Continue doing this same step on each portion of the leaf until each has multiple seams and the leaves are able to stand up-right on their own. 3. With the green embroidery thread sew leaves onto the green t-shirt until the shirt is completely covered and looks full. 5. Cut white felt into 2inch ovals and the yellow felt into 1inch ovals. Glue the yellow oval onto the center of white felt oval to create an egg slice. 6. Using the needle and embroidery thread again attach red pom-poms, croutons, and egg slices all around the leaves which you have already sewn to the t-shirt. 7. Put the shirt on your adorable model, adorn with the Chef hat and VIOLA! your Chef Salad costume is complete!